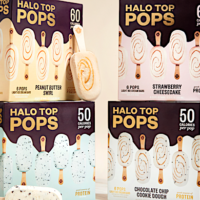 Halo Top is launching a new Halo Top Pops line, which are snackable mini ice cream pops that come in four delicious flavors. On Valentine’s Day (February 14th) at 12PM ET, you’ll have the chance to score FREE Halo Top Pops Ice Cream for the first 1,000 only when you follow this link and use code HALOTOPPOPS (select states only) at checkout! While supplies last.